For Celebrity Cruises®, the name for its newest ship was obvious. 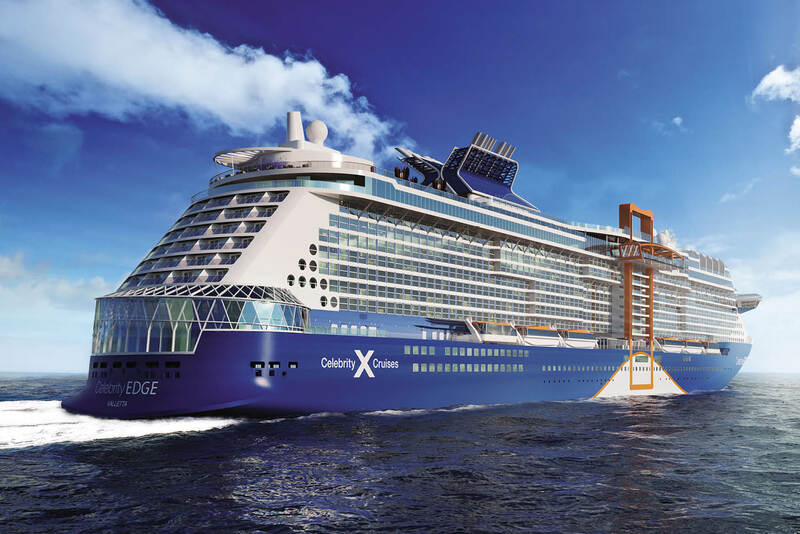 Set to launch in December of this year, Celebrity Edge® is the ship that will change cruising forever. This revolutionary ship is like no other before – every design element was pushed to the edge of possibility, and carefully considered to exceed all expectations. And that it does, with some of the most attainable luxury, innovation and transformational concepts at sea. ‘Some resorts have a beautiful view, ours has thousands’, Celebrity says of its suites on board Celebrity Edge®, which feel more like modern urban apartments than ship accommodation. The largest suites in the entire Celebrity fleet, Celebrity Edge’s Iconic Suites are located high above the bridge, making guests feel on top of the world – or perhaps at the edge of the Earth – with panoramic views, two bedrooms and two bathrooms, and an outdoor area with hot tub and day bed. The breathtaking two-storey Edge Villas are the first of their kind in the Celebrity fleet – boasting one bedroom, two bathrooms, private terraces, floor-to-ceiling windows, plunge pools and personal butler service. While those in the Edge Staterooms can, with the simple touch of a button, transform the entire stateroom into an ‘Infinite Verandah℠’. The floor-to-ceiling window retracts, allowing even larger living space and access to sea breeze whenever one likes. So long, pokey cabins and portholes! The beauty of Celebrity Edge® is that all staterooms and suites offer a luxurious experience, due to its thoughtful design which allows for a king-size bed in 99 per cent of the rooms. There are also a number of interconnecting options, making it easier for larger families to comfortably travel together in a variety of accommodation options. Add to that twice-daily housekeeping, custom-blended bath products, and Celebrity’s eXhale™ bedding with exclusive Cashmere mattresses. Outside of guest sleeping quarters, the public areas also have an edge to them. No expense was spared, from a seven-tonne chandelier in The Grand Plaza that is the central gathering space, to 7000 square feet of glass in Eden, a space resplendent in lush greenery that transforms from day to night. It has a café and bar, indoor and al fresco dining, activities such as yoga, cooking classes, wine tasting and pairing, and artistic performances that are integrated into an unforgettable dining experience. ‘We’re not pulling back the curtain, we’re taking it away’, Celebrity says, with all aspects of the ship possessing a wow-factor, be it with performance, immersive or aesthetic. Though if you prefer to sit back and enjoy the spectacle, the entertainment at The Theatre has four shows that will keep guests on the edge of their seat, with transformative stages, projectors, spiralling staircases and aerial rigging. But if that’s not extraordinary enough, make like Aladdin and take a Magic Carpet ride on board Celebrity Edge®. This unique feature is the world’s first cantilevered platform on the edge of the ship, 13 storeys above sea level. Transforming into different spaces, depending on which level it is on, the Magic Carpet can be a dining room, pool deck, or space for enrichment talks and workshops, with the added thrill of feeling like you’re soaring over the ocean. Up on the pool deck, a 22-metre lap pool is flanked by sun lounges, private cabanas that overlook the ocean, and a couple of two-storey martini hot tubs (as in, they are shaped like a martini glass) offering a sky-high soak. The jogging track winds its way around a living Rooftop Garden, where you can feast on a barbecue grill, enjoy a cocktail, listen to live music and experience A Taste of Film, where the food is inspired by the film. Indeed, food, glorious food is a key part of the cruising experience, and onboard Celebrity Edge®, world class dining is at your fingertips. Gone are the days that it is all just about gluttonous buffets. On board Celebrity Edge® guests have the exciting choice of four complimentary dining options! Choose between new American with global influences, refined French cuisine, Mediterranean fare and rustic Italian, with ample spots to relax with a drink, whether it be at the dazzling Martini Bar, country club-style Sunset Bar or the glitz and glamour of the Casino Bar. Rivalling some of the world’s most luxurious hotels, the Celebrity Edge® is cutting-edge design, a refreshing new-look cruising experience that brings luxury to everyone. Or call 1800 270 747 for more information. I live in Perth and have cruised before on the Carnival Spirit. But am now a solo traveller. Looking for something either Ex Perth to say Singapore or Fly to Singapore and then cruise in that area and fly back. Very hard to find single person cruising. Not interested in internal cabin. Looking at first 1/2 of 2020. Thanks Mark! I have just flicked you through a separate email with contact details for Celebrity Edge. If you have any more questions please don’t hesitate to contact myself or them. You would have to pay me to travel on t his thing…even then I would hesitate! Thanks for your feedback Rick! Did you find you had a bad experience on board a cruise liner or is the experience just not for you? My husband and I love cruising and hope one day soon we can go on board the Edge, we’ve experienced Solstice and she was amazing enough. Thank you so much for commenting Julie! You’re right, this cruise liner IS incredible. Pop it on the bucket list! Meanwhile if you have any questions or queries at all, the Celebrity Edge team are more than happy to help out! Their number is 1800 754 500 or you can visit celebritycruises.com.au when the time is right! I absolutely LOVE cruising but as a SOLO cruiser cannot afford to cruise due to the Single Supplement charged by the Cruise companies. I have cruised with P & O, Royal Carribean and Princess Cruise lines. I long to cruise again but even a 5 Day Tasmanian cruise is expensive for me, as a Retiree, for what I would get due to the crippling Single Supplement charged. Not everyone has a partner/spouse or cruise-loving friend to cruise with. I have reached out to the Celebrity Edge guys to see if there is anything they offer as far as reduced single supplement offers go. I will let you know what they come back with!